When you’re looking for the right combination of value and performance in material handling equipment, Mitsubishi forklifts answer the call. Mitsubishi Caterpillar Forklift America, Inc. is a leading manufacturer in the material handling industry, dedicated to helping businesses of all scopes and sizes work safely and more efficiently. With over 30 years of manufacturing experience, you can count on Mitsubishi to deliver the reliable lift equipment your business needs to succeed. Chicago Industrial is a leading provider of Mitsubishi forklifts for sale in IL and areas beyond. We carry a wide variety of solutions for loading and unloading, put-away and retrieval, order picking and more. 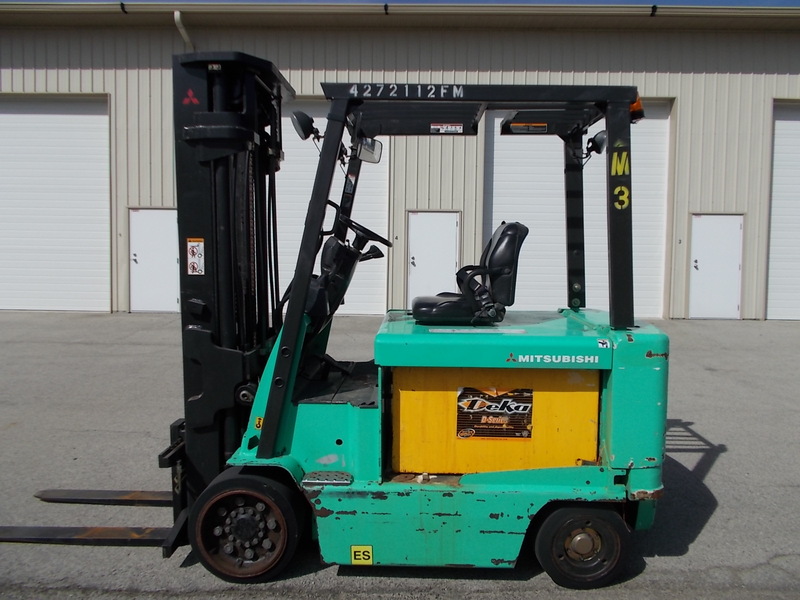 Mitsubishi forklifts come in lift capacities ranging from 3,000 pounds to 15,500 pounds and electric, gas/LP gas/diesel, gas/LP gas and diesel models. Our Mitsubishi lifts for sale are ideal for retail stores, wholesale distribution, freight and logistics, manufacturing, food and beverage, paper and more. Contact one of our knowledgeable representatives for assistance in finding the right lift truck for your specific needs. In addition to selling new material handling equipment, we’re also a trusted source for used Mitsubishi forklifts. Whether you’re operating on a temporarily limited budget or have applications that don’t require the latest technology, our pre-owned solutions often make the most sense. Chicago Industrial ensures the used Mitsubishi forklifts we sell are in prime condition by servicing them in our on-site reconditioning shop. We’re always adding to our selection of well-maintained, low-hour lift trucks, so be sure to check back often for the latest availability. Can’t find what you’re looking for in our inventory? Call us at 815-744-8811 for assistance with locating the new or used Mitsubishi forklift that fits your budget and needs. There’s virtually no restraint on where we can ship our Mitsubishi forklifts for sale. Whether you’re in the Chicago, IL area, on the other side of the continent or just about anywhere else, we’ll ship your lift truck purchase directly to your job site. We put your needs first by offering the economically priced equipment you want, backed by the best service in the industry. We work with Direct Capital, a well-known nationwide lender, to offer a variety of affordable financing options for new and used purchases. Just choose the material handling equipment you want and submit our easy online financing request form for an answer within 24 hours. Experience the difference of working with a Mitsubishi forklift dealer who’s ready to go the extra mile to ensure you are completely satisfied. Get in touch with us today for additional product information and availability, and to request a free quote on any new or used Mitsubishi lift in our extensive inventory.